for a variety of applications: employee badges, access control badges, payment cards, transportation passes, and more. With Zenius, Evolis unveils its new conception of plastic card personalization, with a clear focus on the user and unmatched printing quality. 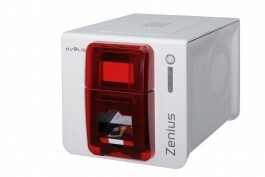 Zenius, the first eco-designed printer, stands out with its optimized features and a compact and sleek design.